SEOUL, Feb. 20 (Yonhap) -- South Korea's finance minister said Monday that the country has a low possibility of falling into an economic crisis in the coming months despite rising concerns over a slew of financial weak firms and increased currency volatility. 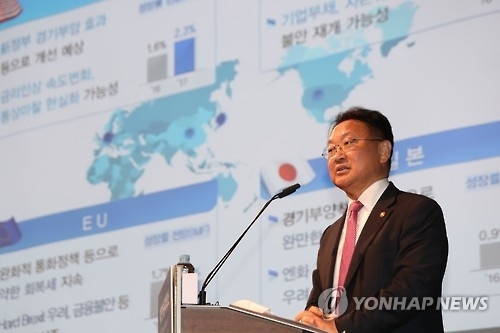 "There is little possibility that the South Korean economy will experience a critical situation like the 1997 Asian financial crisis and the 2008 global financial crisis," Finance Minister Yoo Il-ho said at a conference in Seoul. His comments came as the country is embroiled with concerns that Asia's fourth-largest economy will fall into deep economic trouble in April. Daewoo Shipbuilding & Marine Engineering Co., a major shipyard here, has 440 billion won (US$383 million) in debt due in April, and there are concerns that the shipbuilder will hardly afford to pay the debt amid the dearth of new orders and a delay in the delivery of drill ships. Also, the U.S. government is expected to unveil a list of currency manipulators in April, which may include South Korea along with China. South Korea was put on a monitoring list by the U.S. Treasury Department last year, due to a significant bilateral trade surplus with the United States and evidence of market intervention. "The South Korean government has never intervened in the market," said Yoo. "We are now on a monitoring list, but we are also preparing for many possibilities." The country posted $23.3 billion in trade surplus with the U.S. last year, accounting for 26 percent of the country's total trade surplus.